Back at Duke Breakfast – Free Monuts! 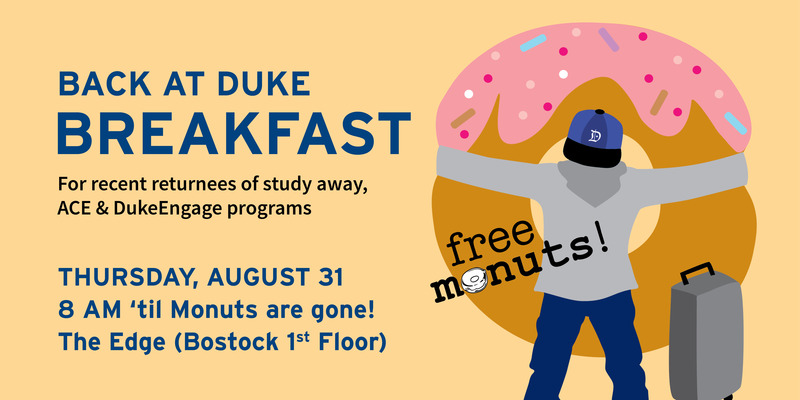 Round up your cohort for free Monuts and coffee in honor of knowing what it’s like to have one foot back at Duke and the other in another world! Coffee, donuts, fruit, and granola bars provided. Please bring a reusable bottle or cup for water. Hosted by DukeEngage, Duke Global Education and Rubenstein-Bing Student-Athlete Civic Engagement (ACE) Program. It will be a great chance to reflect on your time away and find out ways to use your time away to further your personal and professional development. Let us know you are coming by clicking here!